A recent discussion of Dan Lepard's Black Pepper Rye got me interested in this bread. There are enough interesting aspects of this mix and method I had to try it. I followed the steps outlined in Dan's blog and carefully examined the detailed photos he provided. The process calls for boiling coffee with half the rye, pepper and the seeds. I watched carefully as bubbles started to erupt off the bottom of the pan. I thought surely it isn't actually boiling, I'll let it go just a little longer. Be forewarned, when the bubbles start to surface, stop whisking and pour the rye mix into a waiting bowl for cooling. I waited and ended up having to add an additional 1/4 C of water. Next time I'll be quicker. If you click on the link below, it will take you to the recipe page and more important the method with images that will be all you need to make this terrific bread. As you can see the crust is loaded with Poppy Seeds and it smells wonderful coming out of the oven. The crumb is somewhat dense as expected with a 30% rye. It is moist and has a nice pepper and fennel flavor. It's a very full flavor, I would say exotic wholesome. My wife and teen daughter are ecstatic about the flavor. The after taste stays with you like nothing I have ever tasted. This is a keeper. There are lots of variations I can think of that might be fun exploring with the base concept. This is the first loaf I have made in a long while that makes you want to keep eating it. Really, what a flavor! I don't own any of Dan Lepards books yet but, after baking this bread and seeing how hands on he is with his blog, helping his followers, I'm ordering a copy of "The Handmade Loaf" today. Thanks Dan! Looks wonderful, can almost smell it here! Just wanted to mention the link you provided to Dan Lepard's blog actually goes to Jeremy's post on his experience with this bread. Thanks Robyn, I must have been sleeping today. The Handmade Loaf is known as The Art of Handmade Bread in North America. It's a great book. I didn't realize there were two versions. I bought The Handmade Loaf in paperback. I wonder if it's the same thing? I think The Art of Handmade Bread has a few American ingredient substitutions and measurements in it but otherwise they are the same. I have The Handmade Loaf too and it hasn't been a problem... I have to approximate the instant yeast to use instead of the fresh yeast the recipes call for, but that is about it. goods. I bet it was wonderful in this loaf. The color is spectacular. I really don't smell the coffee at all but I suspect it is part of the complex flavor. This type of bread is new to me. 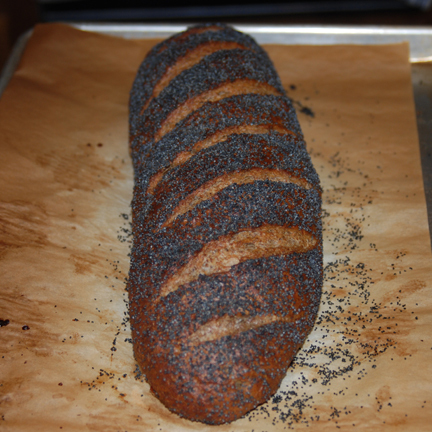 I haven't made a pepper bread and while I did make some Russian scalded rye a few times, it wasn't as good as this is. I brought some smoked ham home tonight for a little snack with this bread. Wow the pepper and anise really come out. You gotta try this. I love it's a quick bread too. About 2 hours from start to bake. Truly one I would like to try! Thanks to Eric and Jeremy for bringing our attention to the recipe! Most of my experiments in rye, outside the norm, are as a result of following your lead. I do hope you try this mix. I have never tasted a smoky flavor like this that contrasts with the meat. It''s very unusual. Wow. Your description of the flavour of this bread is reason enough to have a go at this sometime. Looks fantastic too. and thanks also to Jeremy and Dan also for the blog post and recipe. That's a beautiful loaf of bread and the thought of coffee, fennel, pepper, etc. all sound too good to wait too long before trying. Your description of the taste is enough to get me going. I just mixed up the beginnings of Mark Sinclair's multigrain to bake tomorrow before noon. I doubt if I can squeeze this rye in before I go off for a lunch date but I'm going to try. That was exactly the mistake I made. And I agree with everything you said about this bread and about Dan. He mentioned, on my blog entry, that it is good toasted with peanut butter. As someone who routinely grinds a little fresh black pepper onto peanut butter (and melon, but that's another story) I can't wait to try that. Alas, no peanut butter in the house, and here in Italy is isn't easy to find the good stuff. it's easy! (just the thought of this bread toasted.. and then with PB!) You guys have got me hooked to try this bread. I've been following your threads. I am short on the poppy seeds and trying to think of a substitute. Got any ideas? This would also make a great grilled cheese! Mini, you're right, I should. But I don't have a proper blender, just one of those stick things. It does have a "liquidiser" attachment in a little bowl, but I've always assumed that the motor would not be powerful enough, and I don't want to burn it out. Still, could be worth a try. I used sesame on my loaf. I was also tempted to try kalonji (Nigella, sometimes called onion seed, although it isn't). 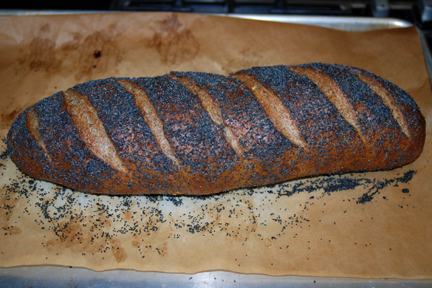 I covered my loaf with as many poppy seeds as I could get to hold on the egg wash. It was a dense enough coating that I could readily taste them and I think that is part of the smoky flavor along with the black pepper. Maybe Dan will comment on possible substitutions. Really no poppy's? I tried the PJ this morning and it was delicious. Then, after hearing Jeremy go on about grinding pepper on top of the PB, I tried that. It was delicious. I think it would be more pronounced with a regular bread but I'll do it again. Mini, you made me do it, and am I glad. My little Braun stick coped fine with ordinary salted peanuts -- nothing added to what came out of the packet -- and now I have a small jar of fresh peanut butter. Thanks. I should add that it was, as promised, wonderful on toasted black pepper rye, without any additional pepper. I sprinkle in a little sugar sometimes before grinding. If you want to reduce the salt, shake it a little in a seeve, don't wash it off unless you dry them first before grinding otherwise they jam up. I do use ground up peanuts as a thickening agent, mostly in Indonesian foods. A great satay sauce can be made using peanut butter, sweet & hot chilies, roasted onions, garlic and black pepper, hacked and mashed together in mortar or tall Braun beaker. Add water and boil, stirring and adding small amounts of water until desired consistancy. Don't forget to top off with sweet soy sauce, "Manis" and thinly sliced shallots. Don't know if this goes well with the bread though, too much the same but... if you were to take the bread and spread peanut butter, and then thinly sliced roasted chicken, shallot slices and some of those tiny sliced cornichorns (or cornies then shallots,) it might just be a hit! I'm debating weather to add a thin slice of tomato and drip on something sweet (balsamico vinegar?) under and over the chicken? Just wait until my bread comes out of the oven! I'm getting ready to mix it now, the starter should be ripe for my hybrid experiment. Can you tell it's lunch time here? I, like you Eric, think the poppy seed flavor is very important. And I was fretting about them until I carefully went over Dan's article... I caught him! look at the yellow strip and red writing. Loaf is almost done, used white sesame seeds like many others. The smell, like you said, is fantastic! I did take a whole hour to final proof. Thanks guys... I love the non sticky dough, not like a rye at all! This is a super easy and great tasting loaf! It's half gone and I haven't even tried the PB yet. Simply eaten with mozarella and slices of smoked sausages. The taste was wonderful and passed a three panel Austrian taste test. The pepper is not as strong and one may think. It got the thumbs up and it's a keeper. Coffee taste? They couldn't tell. I couldn't either. I'll be making this often. If you ever get the chance to watch a Vitamix demonstration in person, take the time to watch it. The samples are great. They made peanut butter with Beer Nuts once while I was watching. It was awesome. You can use just about any kind of nut to make butter. The vitamix is a heavy duty machine, but you still have to be careful not to overheat it. Hopefully you won't break your stick. Thanks Paul. I had never heard of Vita-mix but I took a quick look at the web site and it does seem like an impressive machine. Unfortunately I don't think they are available in Italy, and I really do not have spare counter space. I did not realize you are in Italy Jeremy. (Isn't the internet an interesting place?) It's kind of a shame you won't get to see the sales presentation these guys do. It is almost as good as the machine. They do our state fair every year along with many other venues. The samples after each demonstration are a nice little bonus. One of the salesmen said their customers come in two classes - health nuts and alcoholics. You can make a lot of healthy food choices with the unit. It has a distinctive sound. I can pick out the sound of one if I go to a bar that is using it. Good luck with your peanut butter. I am in the US at least twice a year, and will put this on my list of things to do. Thanks again. Weavershouse, Floyd, Jeremy; Thank you all. WH, Marks Multigrain is a favorite with me too. I'm still tuning the grain selections for the "perfect mix". This is an unusual combination I think you will enjoy. Floyd, Now that you mention it, I did wonder why most of the measurements were volumes. I don't mind converting them. Do you have any suggestions from the book for unusual breads with great flavor? If this is bread is any indication, I'm going to like it. Jeremy; The contrasting spices used here are wonderful. I can't say that I have ever ground pepper on my peanut butter toast but I will today. I have put a dash of salt on melon but I can see the pepper too. I like the way you think! I can't wait to get into Dan's book. My personal style has been to focus on one or two authors so I can understand how to best replicate the intentions of the baker. I'll make the same bread multiple times until I really get it. It's never been about the recipe for me. The technique and handling is everything. From this and a few other things of Lepard's I have looked at, he has a great understanding of how to arrive at the finish with full flavor. There are a lot of "average" breads to bake. This isn't one of them. Thanks again Jeremy for pointing the way here. From your discription the flavor scores big in enticment and delighting the tastebuds. Great to have something different to explore and out of the "average". Well, Eric, I hate to say I told you so, but I have mentioned Dan's book as being wonderful - many times. Hope you will agree once you receive it. I haven't had any success with rye in any form and tend to look the other way when I see it as an ingredient. My last effort produced two nice baseball bats. However, who could resist coffee, rye and black pepper? Your loaf looked so perfect and your lyrical description of the flavor did the trick and I went out to buy seeds to try this recipe for myself. 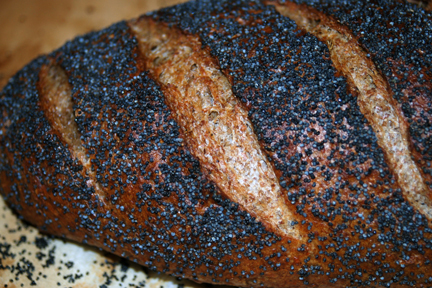 I got caraway and anise, sure that I had poppy seeds at home. Unfortunately they were already mixed in with other seeds for Dakota bread, so I used sesame seeds for the topping. I was very careful not to overcook the rye/coffee mixture, thanks for the warning, and added caraway seeds and freshly crushed peppercorns. All went well but I'm pretty sure I didn't let the shaped loaf proof long enough. I went by Dan's instructions, 45 minutes, but my kitchen was cool and it probably needed longer. I brushed with egg and milk wash, slashed and threw on the sesame seeds and into the 450* oven. All this long winded approach to some questions: I thought the top was getting too dark after 30 minutes - did you use 450* and did you bake it for 40 minutes? I wasn't sure about using my thermometer - nobody had mentioned the internal temperature so I waited until it was 190*. Did you test your loaf? I seem to think rye loaves are supposed to be left until next day to cut? Is this true - I'm dying to see the crumb? I want to try this again but hope you will have time to answer, A. Be sure to try the White Thyme bread with picholine olives! There are so many good books and I am easily distracted. Early on, I decided to stick with Bread from Hamelman and the BBA , WGB from PR to begin my bread baking education. Now I'm branching out. My proofing loaf could have gone longer also I'm sure. I set the timer for 40 minutes and baked it the full time without looking, at 450F. I usually turn with 10 minutes remaining but I got distracted and missed that detail. I didn't check the internal temp but the crust didn't look overly thick. I really think this is a pretty much fool proof bread if you can get past the initial hurdle of cooking the rye to long. Is this White Thyme bread like a foccacia? I see the post you did with the recipe. I'll have to give it a try. Eric, thank you for answering my questions - I am inclined to obey the printed word even when I have a feeling that I should follow my hunch - in this case that more proofing was needed. I have just eaten a slice of the bread and found that the crust had softened after a night in a plastic bag. The crumb is tight, not surprisingly, but the flavor is terrific. No hint of coffee but the occasional burst of pepper. I know that my son ( who adds hot pepper sauce to everything!) would love it for his sandwiches. I'll definitely be making this again. Yes, the White Thyme bread is more like a foccacia - I remember it being a very lively dough. Let us know what you think of the book, A. "New flavors", this is exciting! Yes Eric, please try the White Thyme and pichiloine olive bread. We will be sitting on the edge of our seats! We'll be expecting a full report! Even if this was not a new thing, it is to us who have not had it before! Thanks for the breath of fresh air! The taste of roasted sesame or onion seed or poppy I think changes the outcome. Probably the amount of seeds lends a more prominent flavor. I know I could taste the poppy. Mini I'm glad to hear you liked the sesame version. I don't have enough experience with seeds to know how one would change the flavor over another. One of the best Italian breads I have made was when I went to lengths to cover the loaf in sesame seeds that had been toasted lightly. Sesame are so aromatic. I'm glad you all are enjoying Dan's bread. I guess I'm late to the fan club party but better late than never. I noticed to like Mini, that the package said sesame seeds and I think there is quite a difference in the flavor of poppy seed and sesame seeds. 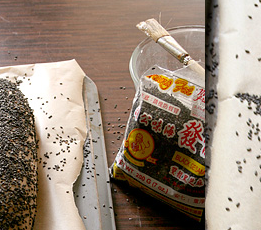 Black sesame seeds are supposed to taste the same as the light ones. I think the poppy seeds would be the best choice because they are going to add a kind of 'sweetness' to the coffee and pepper. Sesame adds a real nutty taste..my opinion only! Have you ever tasted poppy seeds made into a sweet paste...oh yummm! I didn't see any steaming references. My loaf finally felt at 45 minutes like I could pre-heat my oven (takes only 15 min) and put it to bake when it had proofed a whole hour. I decided to steam for 12 minutes at 230°c or 445°F and turned it down to 210°c or 410°F to bake another 23 minutes. I also rotated the pan and let steam out of the oven after steaming. When internal temp 205°F and it was brown enough, I let the loaf sit on the oven rack with the door open, oven off for about 10 minutes. My small oven cools off fast too and warmed the kitchen. Removed to rack on table to cool. The end was cut with a bread knife while still warm but the next slice cut well with a normal sharp blade. The crust seemed to soften as it cooled, the seeds kept their crunch. I also put what was left into a plastic bag overnight. The nice part about using light sesame seed is seeing the color as it browns. It may be tricky to judge browning of with dark seeds and burning can easily happen. Egg wash helps adds a darker surface color to the crust quickly. The pepper flavor is more pronounced the next day, can actually call it spicy! Don't let that scare you though. It really is yummy! What the best internal temp? Hi, this is my first post. I live in Brazil, and must to appologize my english. 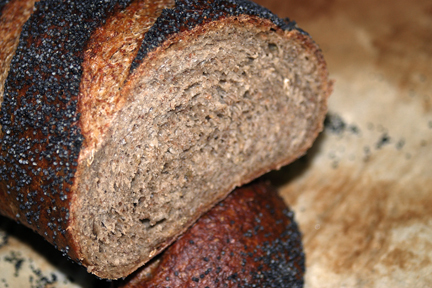 I ussualy bake rye bread until the internal temp is 190º F. Do you fill that 205º F is better?